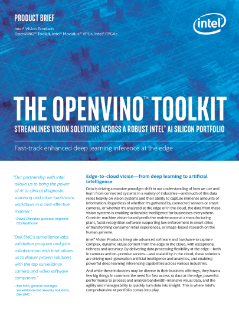 The OpenVINO™ toolkit is a free, downloadable toolkit that helps developers and data scientists fast-track development of high performance computer vision and deep learning into vision applications. It enables deep learning on hardware accelerators and easy heterogeneous execution across multiple types of Intel® platforms. It includes the Intel® Deep Learning Deployment Toolkit (Intel® DL ...Deployment Toolkit) with a model optimizer and inference engine, along with optimized computer vision libraries and functions for OpenCV* and OpenVX*. This comprehensive toolkit supports the full range of vision solutions, speeding computer vision workloads, streamlining deep learning deployments, and enabling easy, heterogeneous execution across Intel platforms from edge to cloud.